The campaign aims to raise awareness of riding motorbikes correctly and how to minimise the risk of serious accidents, and encourage personal responsibility when choosing to ride a motorbike. It is one of the British Consular Team’s efforts to reduce the number of British citizens involved in accidents. This campaign is also an integral part of the British Foreign and Commonwealth Office’s commitment to minimising risks to British nationals overseas through reducing preventable incidents, said British Consul-General Ian Gibbons. According to Tran Huu Minh, Deputy Chief of the Office of the National Traffic Safety Committee, Vietnamese agencies have issued regulations on converting international driving licences for foreigners in Vietnam. The World Health Organization (WHO)’s statistics show that on average one person dies every hour due to road accident in Vietnam. Motorbike accidents are the leading cause of death, severe injury and emergency evacuation of foreigners in Vietnam. Road conditions differ significantly from those in the UK, with many drivers failing to adhere to road traffic rules and patchy enforcement of traffic laws leading to the accidents. 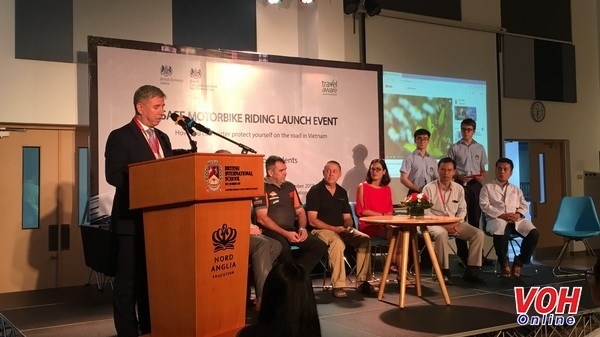 After the launch, the Safe Motorbike Riding Campaign will offer an information booth at British Business Group Fun Run events in Hanoi and Ho Chi Minh City on September 30 and November 4 to raise awareness of the campaign.